Egyptian Reiki transmits to you the energy that existed in ancient Egypt. It was created by Hare in 2016. 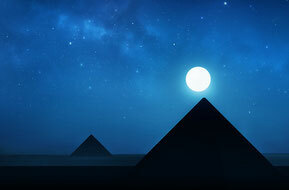 The purpose of this energy work is to connect with the cosmic energy of the space-time continuum named Egyptian civilization, upgrade your energy, and synchronize yourself with the universe. It is a work for self-transformation. This energy is not to be "used" like the energy of Usui Reiki. It enhances your "being." Maybe you have heard of Seichim Reiki. The founder of this work stayed inside a pyramid one night and received the cosmic energy. He created Seichim Reiki system, combining this energy with Usui Reiki energy. Seichim, or "Sekhem" in another form, is the name for "Power" in Egyptian language. I received Seichim Reiki many years ago and found it very profound. It changed my "being" forever. However, since this system is a compilation of Egyptian energy and Usui Reiki, energetically speaking Seichim Reiki cannot be called pure Egyptian energy. Thus I created Egyptian Reiki by removing energies not directly related to Egypt, and adding new energies I received from the space-time continuum of Egypt. This is a work that brings cosmic energy to people on this space-time continuum of the Earth. The Egyptian civilization I refer here is not exactly the same as the one that you know, say, by reading history textbooks. The Egyptian civilization is actually much more than we currently know. In fact it is one of the cosmic, namely extraterrestrial, civilizations that exists out of the Earth's space-time continuum. Since it exists out of Earth's time frame, you can say it is not the things of the past, but it "exists now." The Egypt we know is just a tiny manifestation in our time-space continuum of this vast, cosmic civilization. It was, as it were, "the Earth branch" of a cosmic civilization. This Earth branch no longer functions in our world, but the main office still exists and continues to work on humanity from an extraterrestrial region. In a sense, this place is a kind of bridge connecting the Earth with some star systems farther away from the Earth. 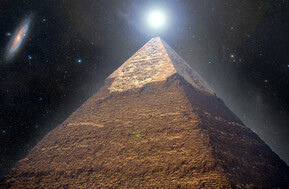 Many people in the cosmic Egypt have origins in other systems such as Sirius, Pleiades, Vega, etc. They are staying in a region near the Earth's space-time and help humanity evolve spiritually and someday join the Star Alliance of advanced cosmic civilizations. Egyptian Reiki has seven stages, each with an attunement that can be done by skype or remote. In attunements you will connect energetically with the interior space of a pyramid, and go beyond it into the depth of cosmic dimensions, and receive energy transmissions. You might wonder why "Christos" comes here. Actually Christos and Christ energy are similar, but slightly differ. Christos is more archaic and primordial. 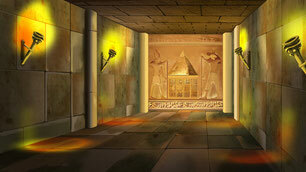 Inside a pyramid: This image just looks like what I saw in my vision, and captures the energetic essence of this work. I received many transmissions from Sirians in this chamber. You will go through the back wall to the other dimension and stay there for some time. Though invisible, there are many cosmic beings in this room. Fee: 100 US$ for each stage. Stage 1 and 2 must be applied together because Stage 2 should be done immediately after Stage 1. If you apply for all seven stages in advance, I can offer 15% discount (595 US$ total). Requirements: No requirement, but some experience in energy work, especially grounding, is preferred. Experience in Usui Reiki is also preferable. Intervals between stages: Stage 2 will be done 1-2 days after Stage 1. Stage 3, 4, 5 and 6 will be done 1-3 days after the previous stage. Stage 7 will be done 3-5 days after Stage 6. Paying method: PayPal. I will send you a PayPal bill after an application. For residents in Japan, bank transfer is also accepted (Yucho Bank or Rakuten Bank). Cancellation Policy: Not refundable, because once you apply for the work all the preparations will get started at that moment energetically, by me and by someone up there as well. If some inconvenience comes up, you can postpone the transmission dates until you are ready. Note: For each stage I will send you in advance an e-mail with the information how to receive the transmission and an energy exercise recommended after the attunement to consolidate the energy change. Please notice that in this work there is no symbols and mantras like Usui Reiki, though the names of the stages such as Osiris and Isis have the power to evoke the specific energy and thus play the same role as Usui Reiki symbols or mantras. Finally, I'd appreciate it if you understand that the completion of all seven stages does not qualify you to give the same attunements to others. The purpose of this work is for your spiritual benefit only.